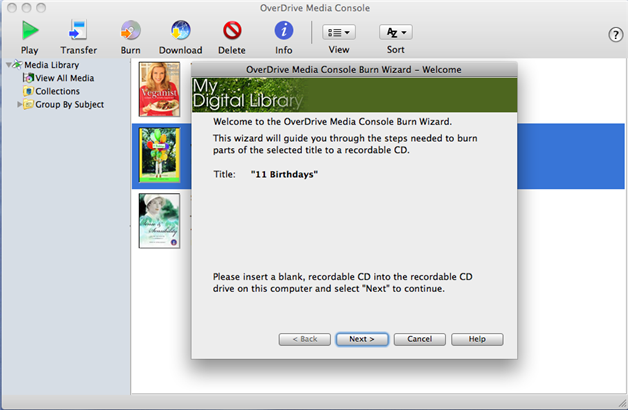 You can use OverDrive's desktop app to burn audiobooks to CDs. 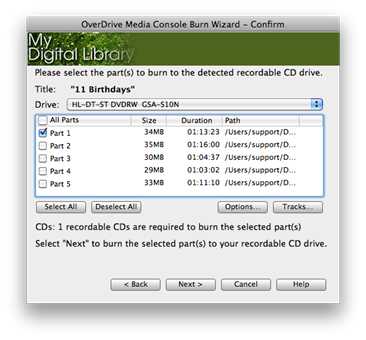 Note: Due to agreements with publishers and digital media suppliers, audiobooks from OverDrive can't be burned to DVD or Blu-ray. Select an audiobook and click the Burn button. The burn wizard will open. When the burn wizard finds your CD drive, you'll see the "Confirm" screen. Select the part(s) to burn. You'll need one CD for each part. Click Next. When the burn finishes, you'll see the "Success" screen. Click Finish to close the wizard.